I’ve always thought that as an adult, one should have a go to, meal, dessert, and appetizer in his or her cooking repertoire. Ideally the dishes should be easy, tasty, and just a little bit unique… ( Mine are: endive bites, coconut oven fried chicken, rosemary thyme sugar cookies. ) Even if you don’t cook for yourself on a regular basis, you still need to be able to have those meals you can pull together to impress a date, the in-laws, or survive a work potluck or bake-sale. These items don’t necessarily need to be cohesive, and they most certainly don’t need to be complicated… but having these go to meal components up your sleeve will most definitely come in handy. Tangent: You might also want to consider adding a vegan dish to your repertoire. Because lets face it, we all have vegan friends, and they like to eat delicious things too, and though they are choosing to miss out on things like crème fraiche, you also don’t want to be the friend who serves them things that taste like cardboard because you can’t figure out something delicious and plant based to make. Fact: Cooking vegan is NOT THAT HARD… and yet I know so many people who down right panic at the idea of eliminating meat, and dairy. Last year I had two Vegan and gluten free friends over for dinner… we had a delightful meal of black rice, raw zucchini noodles and tahini dressing with roasted vegetables…(ok, confession, I rarely cook meat a home, because it grosses me out, and since I rarely cook it it makes me nervous… so when I’m at home I’m mostly a vegetarian… so I’m allowed to go off about how vegan cooking isn’t that hard… because if you take eggs and cheese out of my diet… I pretty much live in a land of quinoa and roasted veggies…) and as we sat there, they told me about all the dinner party horror stories they had from people who just couldn’t quite get a grip on vegan cooking. 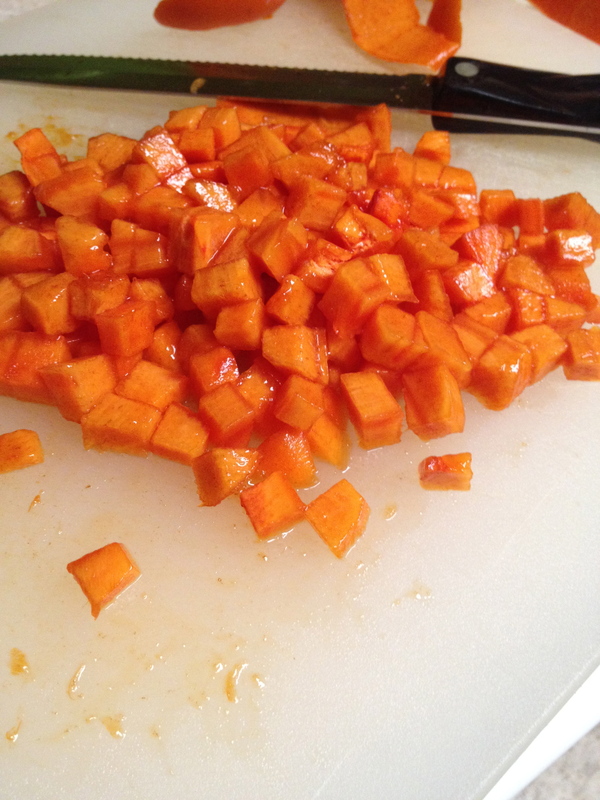 Here is a hint… just because you are limiting your ingredients does not mean you have to limit the flavor. Plants are delicious, seasonal plants are even more delicious… you can still use things like salt, and spices, seeds and a myriad of other things to make your food taste awesome. But I digress, and this IS supposed to be about appetizers.. and is, in fact, not a lecture on life skills and eating habits…. 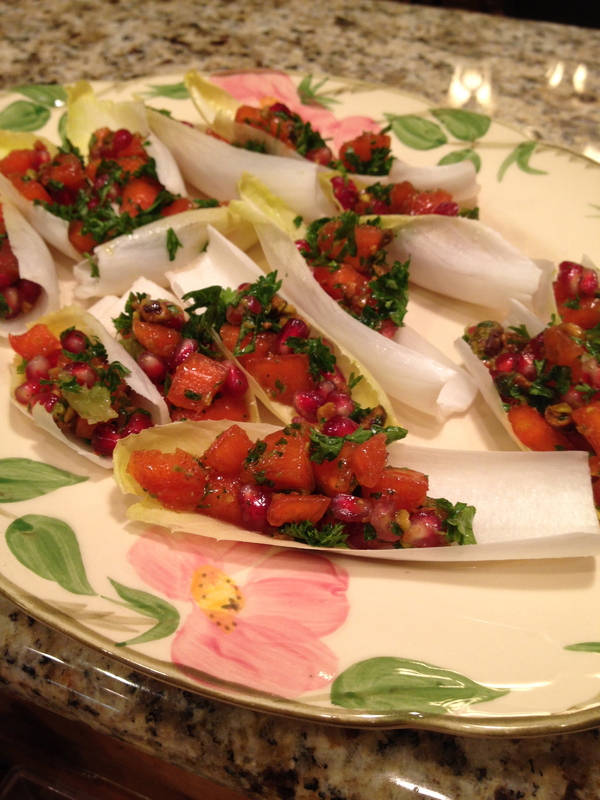 So onto Winter Endive Bites. Here is what I love about endive bites. Everything. They are ridiculously simple, but seem a little bit fancy, so you kind of get extra bang for your buck. You can make them in about 5 minutes, put just about anything in them, and they act as their own cup, so they are a completely self contained nibble that works great for passed apps, or stationary h’orderves. The endive is crunchy, so you automatically have texture built in, and the bitterness of the green is remarkably versatile. You could come up with hundreds of different fillings to put in endive bites, but one thing to consider is texture, color, taste and overall presentation. (another favorite is roasted beets with walnuts and blue cheese… or blood oranges with fennel, parley and chévre) What I love most about this particular recipe is the marriage of sweet and savory. The persimmon has a little sweet nuttiness to it, and the pomegranate is simultaneously sweet and tart. The pistachios add some texture, and then the gremolata brings in a little zing. There are a lot of flavors at work, but they all meld together to present this really gorgeous bite. Cut the bottoms off the endive and separate the leaves. Wash and dry the endive leaves and set aside. 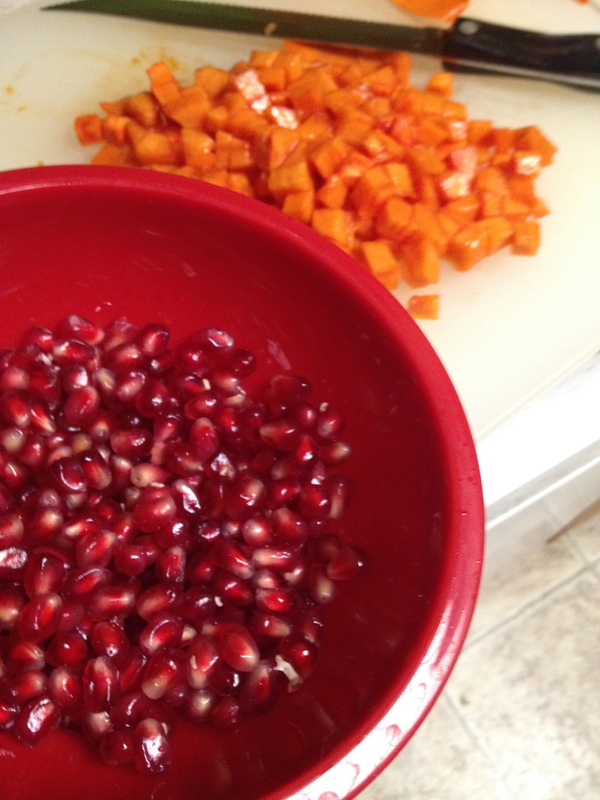 Cut the persimmon into small chunks and place in mixing bowl with pomegranate seeds and pistachio. Lightly mix together and then add 2-3 spoonful’s of gremolata. Drizzle with olive oil. Taste, and add salt as needed. 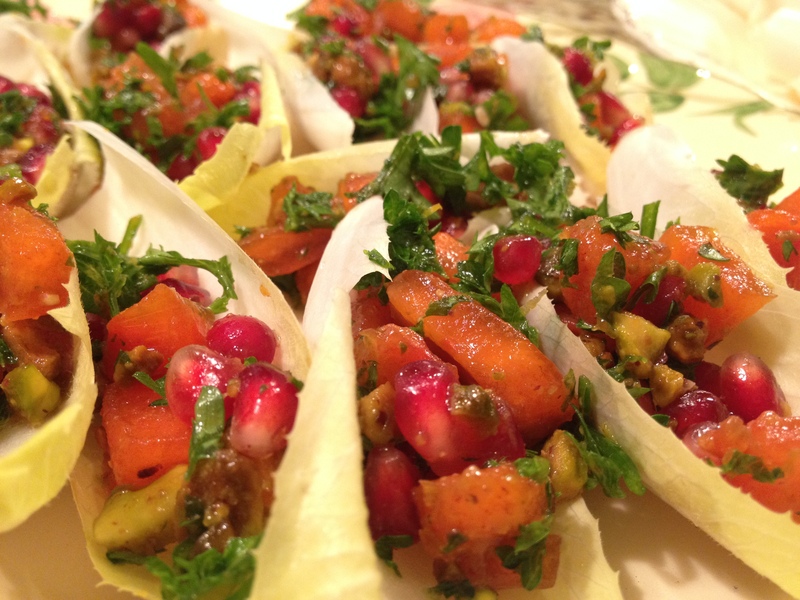 Scoop the mixture into endive cups, and serve immediately. 1 bunch of parsley, chopped. 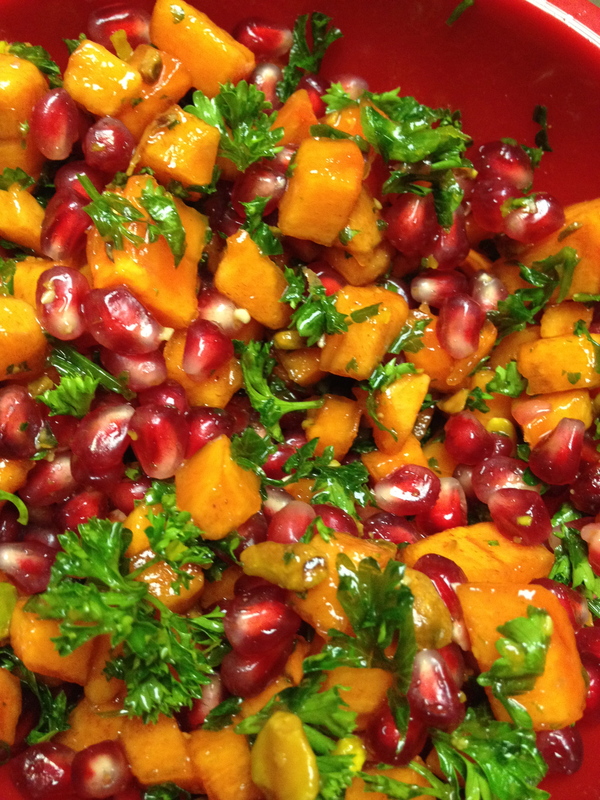 Mix gremolata ingredients together in small bowl and set aside. *Gremolata is one of my new favorite things. It is great in soups, on salads, mixed in with rice, on fish… the list goes on. For this recipe, I recommend making it separately and adding it to the rest of the filling, that way you can keep the excess gremolata to garnish other dishes throughout the week. Note. The gremolata will last a few days in the refrigerator but due to the texture of the persimmons, the fruit mixture doesn’t keep as well.